This is the fourth installment in a five-part series summarizing and commenting the 5 December 2014 US Department of State “Limits in the Seas” issue explaining the different ways in which one may interpret Chinese maritime claims in the South China Sea. It is a long-standing US policy to try to get China to frame her maritime claims in terms of UNCLOS. Read part one, part two, part three. The third way to see the dashed-line, according to the Limits in the Seas series paper, would be as a historic claim. Under UNCLOS this can take two forms, “one of sovereignty over the maritime space (‘historic waters’ or ‘historic title’)” or “some lesser set of rights (‘historic rights’) to the maritime space.” The paper devotes much more room to discussing this possibility than to the two previous alternative interpretations. It begins by pointing out that “some Chinese government statements and acts could be read to support a version of this historic claim interpretation”, and by noting that given that “the dashed-line maps pre-date the People’s Republic of China, the views of Taiwan are also of interest.” Concerning the Island’s claims, the text underlines that while in 1993 its “Policy Guidelines for the South China Sea” said that the dashed lines enclosed a “’historic water limit’ within which Taiwan ‘possesses all rights and interests’” (see K-H. Wang, “The ROC’s Maritime Claims and Practices with Special Reference to the South China Sea,” Ocean Development and International Law, Volume 41, 2010, pp. 237-252), Taipei has not stuck to this view. “Subsequent maritime legislation enacted by Taiwan and subsequent public statements, however, suggests that this view may no longer be officially held,” noted the State Department in another Limits on the Seas series issue, published in 2005, devoted to Taiwan. While the text refers to this 2005 paper, the latter’s contents do not discuss in depth ROC claims on the South China Sea, as clear from the fact that the term “South China Sea” only appears three times, whereas “dash” is not to be found. Thus, while the assertion that in studying PRC claims one should pay attention to ROC claims seems logical, this is not followed up, either in the 2005 Limits on the Issues paper devoted to Taiwan, or in the 2014 one dealing with China. In other words, the Department of State does not follow its own advice. How should we read this? On the one hand, the preeminent use of “Taiwan” may seem to amount to a limited recognition of political realities on the ground, in opposition to Beijing’s views, further contradicted by the scant regard for ROC practice as opposed to the PRC’s emphasis on administrative and international legal continuity with the Nationalist regime. An alternative, more Beijing-friendly, interpretation of the DOS approach may be that it is treating Taipei as the de facto authority on the Island, also for law of the sea purposes, while restricting its role in the South China Sea, where the PRC has consistently sought to exclude Taiwan from regional fora, in line with its traditional policy towards the Island. More generally, this may reflect the complex and ambiguous status of Taiwan, with neither the Island itself nor countries like the United States completely sure what it is. To add to the confusion concerning Taiwan in the DOS paper, it states on page 21 that “Many islands and other features in the South China Sea are occupied not just by China, but by … Taiwan,” yet again this is not followed by any detailed examination of Taipei’s claims. The DOS reports explains that “some” Chinese Government actions and statements which are “inconsistent with” UNCLOS, while not amounting to “express assertions of a historic claim, they may indicate that China considers that it has an alternative basis – such as historic title or historic rights – for its maritime claims in the South China Sea,” and provides some examples, such as the assertion by Foreign Ministry Spokesperson Qin Gang on 10 March 2014 that the Second Thomas Shoal (Ren’ai Reef) was under Chinese “sovereignty.” Qin Gang said “It is known to all that China has sovereignty over the Nansha Islands and their surrounding waters, including the Ren’ai Reef.” This mantra about sovereignty, together with repeated appeals to history, could indeed be considered as evidence that what Beijing has in mind is a historic claim. Furthermore, it may well be a claim going beyond the provisions for such term in UNCLOS. The report provides further evidence, beyond statements, to support the view that China may be making a historical claim. 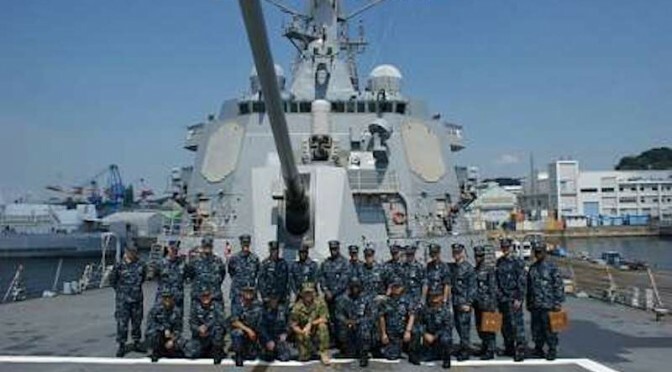 First of all, the “periodic oath-taking ceremonies at James Shoal” by Chinese naval vessels “to affirm ‘sovereignty’ over this bank” and the 2012 introduction by the China National Offshore Oil Corporation (CNNOC) of lease blocks in front of Vietnam’s central coast, in “waters under jurisdiction of the People’s Republic of China” according to the company yet with “portions of two of these blocks (BS16, DW04)” extending “without explanation to waters that are beyond 200 nm from any Chinese-claimed island.” The DOS report stresses that the resulting “assertion of maritime jurisdiction … exceeds what is provided for under” UNCLOS. 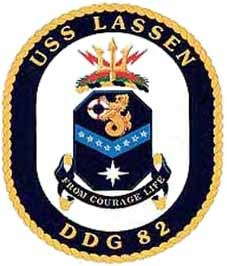 Coat of arms of USS Lassen (DDG 82), which has conducted FONOPS in the South China Sea. Experts have criticized their ambiguity and are still debating their exact nature. The idea that Chinese claims are “separate from, and additional to” UNCLOS is also suggested by domestic legislation, the DOS report notes. As an example it cites China’s 1999 Law on Marine Environmental Protection, which describes its geographical scope as extending to the country’s “internal waters, territorial sea, contiguous zone, exclusive economic zone, continental shelf of the People’s Republic of China and other sea areas under the jurisdiction of the People’s Republic of China” (emphasis in the DOS report). According to the text, UNCLOS is restricted to maritime zones mentioned in the law, and not to any “other sea areas under the jurisdiction” of the PRC, and “perhaps” this is a reference to “areas where China considers that it has historic claims.” Again, we must remember that this could be understood in two different ways, either China making a claim based on historic facts (recognized to a limited degree by UNCLOS) or China laying down sovereignty over certain areas of the sea based on principles and rules outside UNCLOS, or outside the prevailing interpretation of UNCLOS. This is the third installment in a five-part series summarizing and commenting the 5 December 2014 US Department of State “Limits in the Seas” issue explaining the different ways in which one may interpret Chinese maritime claims in the South China Sea. 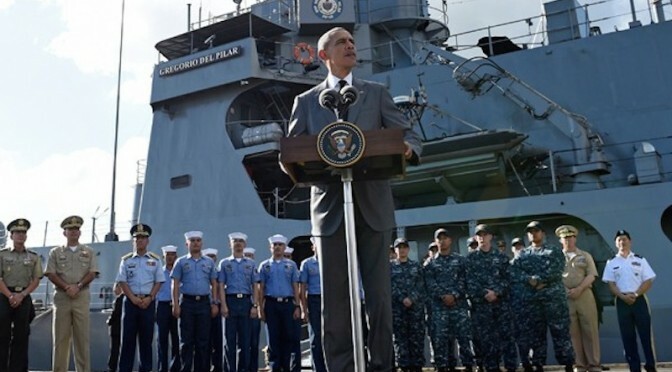 It is a long-standing US policy to try to get China to frame her maritime claims in terms of UNCLOS. Read part one, part two. Let us move to the three interpretations put forward by the US Department of State. This would mean that all Beijing was claiming were the islands within the dashed lines, and that any resulting maritime spaces would be restricted to those recognized under UNCLOS and arising from Chinese sovereignty over these islands. The text notes that “It is not unusual to draw lines at sea on a map as an efficient and practical means to identify a group of islands”. In support of this interpretation one could take the map attached to the 2009 Notes Verbales and the accompanying text, which reads “China has indisputable sovereignty over the islands in the South China Sea and the adjacent waters, and enjoys sovereign rights and jurisdiction over the relevant waters as well as the seabed and subsoil thereof (see attached map)”. The text notes that the references in the paragraph above to “sovereignty” over “adjacent” waters” may be interpreted as referring to a 12-nm belt of territorial sea, since international law recognizes territorial waters as being a sovereignty zone. In a similar vein, references to “sovereign rights and jurisdiction”, “relevant waters”, and “seabed and subsoil thereof”, would then be taken to concern the legal regime of the EEZ and the continental shelf, as defined by UNCLOS. As possible evidence for this interpretation, the study cites some Chinese legislation, cartography, and statements. 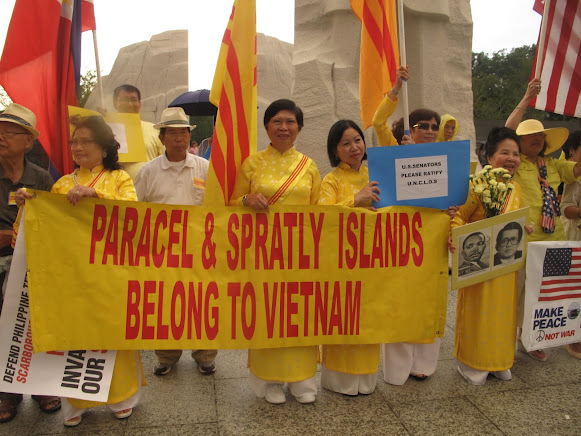 The former includes Article 2 of the 1992 territorial sea law, which claims a 12-nm territorial sea belt around the “Dongsha [Pratas] Islands, Xisha [Paracel] Islands, Nansha (Spratly) Islands and other islands that belong to the People’s Republic of China”. This article reads “The PRC’s territorial sea refers to the waters adjacent to its territorial land. The PRC’s territorial land includes the mainland and its offshore islands, Taiwan and the various affiliated islands including Diaoyu Island, Penghu Islands, Dongsha Islands, Xisha Islands, Nansha (Spratly) Islands and other islands that belong to the People’s Republic of China. The PRC’s internal waters refer to the waters along the baseline of the territorial sea facing the land”. The Department of State also stresses that China’s 2011 Note Verbale states that “China’s Nansha Islands is fully entitled to Territorial Sea, Exclusive Economic Zone (EEZ), and Continental Shelf”, without laying down any other maritime claim. Concerning cartography, the study cites as an example the title of “the original 1930s dashed-line map, on which subsequent dashed-line maps were based”, which reads, “Map of the Chinese Islands in the South China Sea” (emphasis in the DOS study). With regard to Chinese statements, the study cites the country’s 1958 declaration on her territorial sea, which reads “and all other islands belonging to China which are separated from the mainland and its coastal islands by the high seas” (emphasis in the DOS study). The text argues that this reference to “high seas” means that China could not be claiming the entirety of the South China Sea, since should that have been the case there would have been no international waters between the Chinese mainland and her different islands in the region. This is a conclusion with which it is difficult to disagree, although we should not forget that it was 1958, with China having barely more than a coastal force rather than the present growing navy. Therefore, while the study’s conclusion seems correct, and precedent is indeed important in international law, it is also common to see countries change their stance as their relative power and capabilities evolve. Thus, if China had declared the whole of the South China Sea to be her national territory in 1958 this would have amounted to little more than wishful thinking, given among others the soon to expand US naval presence in the region and extensive basing arrangements. Now, 50 years later, with China developing a blue water navy, and the regional balance of power having evolved despite the US retaining a significant presence, Beijing can harbor greater ambitions. 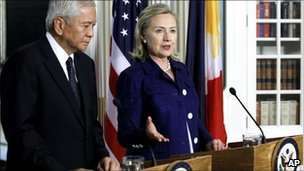 Then US Secretary of State Hillary Clinton with her Filipino counterpart, Albert del Rosario, in June 2011. Washington supports Manila’s arbitration bid and rearmament, but takes no official position on her territorial claims, despite involving former American territory. This section ends with the DOS study stating that should this interpretation be correct, then “the maritime claims provided for in China’s domestic laws could generally be interpreted to be consistent with the international law of the sea”. This is subject to two caveats, territorial claims by other coastal states over these islands, and Chinese ambiguity concerning the nature of certain geographical features, Beijing not having “clarified which features in the South China Sea it considers to be ‘islands’ (or, alternatively, submerged features) and also which, if any, ‘islands’ it considers to be ‘rocks’ that are not entitled to an EEZ or a continental shelf under paragraph 3 of Article 121 of the LOS Convention”. Some of these features, Scarborough Reef for example, are part of the arbitration proceedings initiated by the Philippines. This would mean that Beijing’s intention with the dashed line was to “indicate a national boundary between China and neighboring States”. 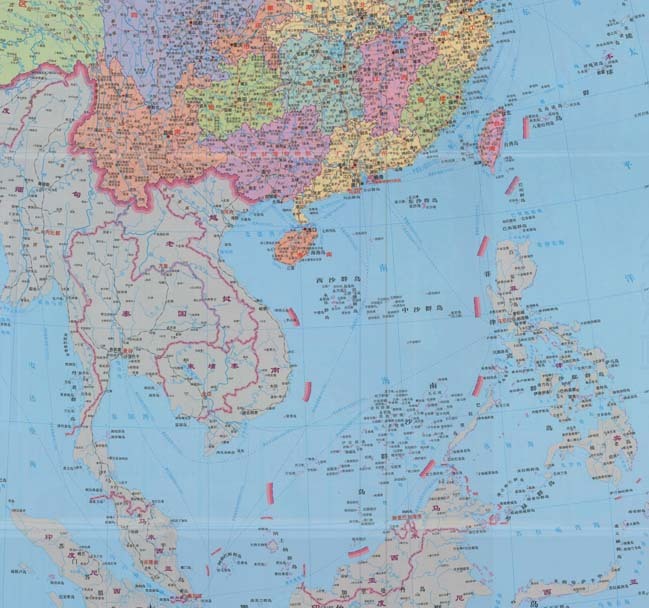 As supporting evidence for this interpretation, the DOS report explains that “modern Chinese maps and atlases use a boundary symbol to depict the dashed line in the South China Sea”, adding that “the symbology on Chinese maps for land boundaries is the same as the symbology used for the dashes”. Map legends translate boundary symbols as “either ‘national boundary’ or ‘international boundary’ (国界, romanized as guojie)”. Chinese maps also employ “another boundary symbol, which is translated as ‘undefined’ national or international boundary (未定国界, weiding guojie)” but this is never employed for the dashed line. The report stresses that, under international law, maritime boundaries must be laid down “by agreement (or judicial decision) between neighboring States”, unilateral determination not being acceptable. The text also notes that the “dashes also lack other important hallmarks of a maritime boundary, such as a published list of geographic coordinates and a continuous, unbroken line that separates the maritime space of two countries”. The latter is indeed a noteworthy point, since border lines would indeed seem to need to be continuous by their very nature, rather than just be made up of a number of dashes. This is one of the aspects making it difficult to fit Beijing’s claims with existing categories in the law of the sea. 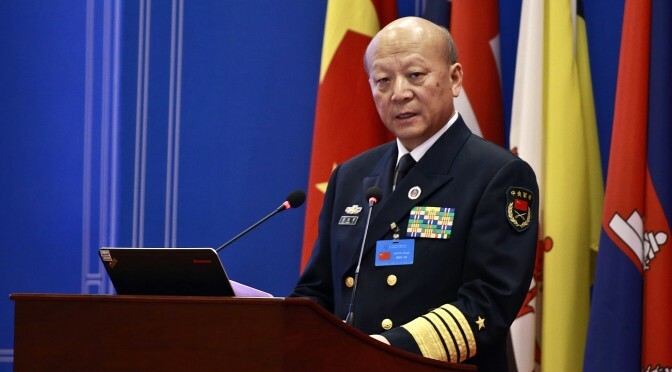 In addition, the report notes that they cannot be a limit to Chinese territorial waters, since they extend beyond 12 nautical miles, and neither can they be a claim to an EEZ, since “dashes 2, 3, and 8” are “beyond 200 nm from any Chinese-claimed land feature”. These last two aspects also make it difficult to see the dashed line as marking one of the categories recognized by UNCLOS. Moving beyond the law, however, and this is something that the DOS report does not address, a certain degree of ambiguity may be seen as beneficial by a state seeking to gradually secure a given maritime territory. Some voices have noted this may have been the US calculus in the San Francisco Treaty. 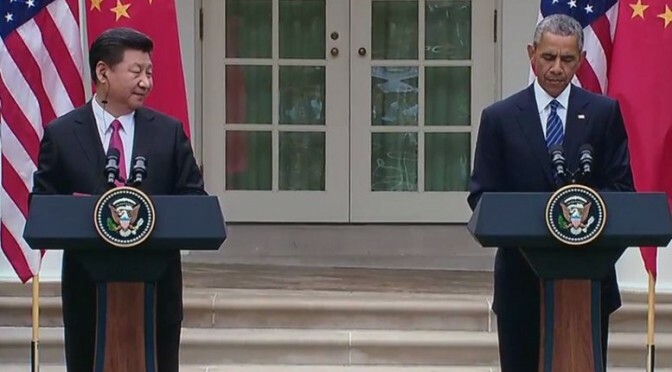 Thus, the technical faults, from an international legal perspective, in China’s dotted line are not necessarily an obstacle to Beijing’s claims, from a practical perspective. This is the second installment in a five-part series summarizing and commenting the 5 December 2014 US Department of State “Limits in the Seas” issue explaining the different ways in which one may interpret Chinese maritime claims in the South China Sea. It is a long-standing US policy to try to get China to frame her maritime claims in terms of UNCLOS. Read part one. Reviewing maritime zones and historic claims. The paper’s second section basically consists of a summary explanation of “Maritime Zones,” “Maritime Boundaries,” and “’Historic’ Bays and Title” according to UNCLOS. Three aspects are of particular significance. First of all, that the interpretation provided is not necessarily that considered correct by China. Although this is not always squarely addressed, when discussing whether Chinese claims in the South China Sea are or are not in accordance with international law we should first define international law, and there is the possibility that as China returns to a position of preeminence she may interpret some of its key provisions in a different way. Second, as the paper itself notes, while China ratified UNCLOS in 1996, the United States has not, although she “considers the substantive provisions of the LOS Convention cited in this study to reflect customary international law, as do international courts and tribunals.” Not all voices take such a straightforward view of Washington’s failure to ratify the convention while claiming that it is mostly a restatement of customary law and therefore applicable anyway. Thus, while China’s position concerning the South China Sea may end up resting at least in part, on the concept of historic waters, even if this is not the case history and perceptions of history will surely still play an important role in determining Beijing’s policy. This, however, is not something only taking place within China, since no regional or extra-regional actor is immune to the phenomenon, adding to the already tense situation in South East Asia. In particular, a couple of centuries later, both the Barbary Wars and the Opium Wars remain powerful factors projecting their shadow on American and Chinese foreign and defense policy. Trying to make Chinese claims fit with UNCLOS: three possible interpretations. The Department of State report then turns its attention to what constitutes the core of the paper, that is three possible interpretations of Chinese claims in the South China Sea and their compatibility or otherwise with International Law. Even without the need to fully agree with the paper’s views, it responds to a widely heard demand for clarification of China’s posture. In this regard, before we sum up the three perspectives, we should remember that while it is an interesting and useful exercise to try to fit Beijing’s (not always consistent) claims within the framework of UNCLOS and customary international law, China may have its own interpretations of the law, or seek to promote a different one. Since international law to a great extent reflects power realities on the ground, this should not come as a surprise, in particular given that in the view of China’s leaders many aspects of international law, and in particular the law of the sea, result from the same power dynamics that led to the country’s fragmentation and subservience from the mid XIX Century. The paper also stresses that it is only in “maritime claims” (emphasis in the original) where “China’s position is unclear.” On the other hand, while some other countries do not accept them, Chinese claims on land are unequivocal, Beijing claiming “sovereignty over the islands within the dashed line”. The assertion in China’s 2009 Notes Verbales that “China has indisputable sovereignty over the islands in the South China Sea” is consistent with previous statements, and means that there is no doubt that Beijing considers all such islands to be national territory of the PRC.